I’m about to commit a couple of acts of heresy here. First of all, I am a Beatles fan. when pressed to choose between The Beatles and the Rolling Stones, I will pick The Beatles every time. I will also pick The Who, The Kinks, Small Faces, and several other bands over the Stones. I don’t hate the Rolling Stones. I just like a lot of other bands more. On top of that, and this is the real heresy, my favorite Rolling Stones album is considered by most die-hard Stones fans to be, by far, the worst thing they ever did. 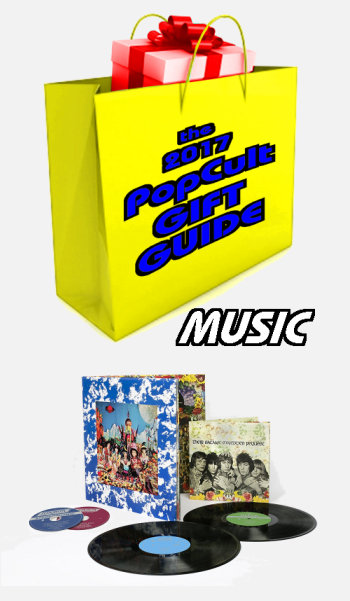 My next pick for the 2017 PopCult Gift Guide is the 50th Anniversary Special Audiophile Edition Box Set of Their Satanic Majesties Request. Even a die-hard Rolling Stones fan would get a kick of out this set, if only for the inclusion of the lenticular 3-D cover on the vinyl version of the albums in this set. This was the Rolling Stones answer to The Beatles’ Sgt. Pepper, and even with John and Paul contributing vocals and all four Beatles showing up on the cover of the album, it fell short by 2000 miles or so. Even so, it’s the Stones at their most trippy and psychedelic, and it’s got some great tunes on it. The discs were remastered by Bob Ludwig this year, and vastly improve the depth of the original mix. Fans who previously dismissed this album would be well-advised to revisit them for a fresh listen. The new mixes reveal a much better album than its reputation. This 50th Anniversary Special Audiophile Edition limited hand numbered box includes the restored original lenticular cover, not available for over 30 years, with 180gm Vinyl and Hybrid SACD versions of both Mono and Stereo versions of the album. That’s two vinyl discs and two SACDs. Both recordings are newly remastered by Bob Ludwig at Gateway Mastering.You also get a 20-page book, with an essay by Rob Bowman, that also includes Michael Cooper’s photos from original cover shoot. In my early days of collecting vinyl, almost forty years ago, it was damned near impossible to find the lenticular cover for less than a hundred bucks.This box sets lets collectors scratch that itch with a new reproduction that looks fantastic. This set is available for under $75 at record retailers who carry box sets, or you can zip on over to Amazon. This is a great gift for the die-hard completist fan of the Rolling Stones, or folks who love British Psychedelic music.